For a few days in the spring, the view from Jefferson Street bridge in downtown South Bend will cause residents to stop and take note. The University of Notre Dame is working with South Bend officials and residents to design an “ephemeral garden” on the bridge, a temporary oasis of grassy spaces, plants and pavilions that would let visitors relax and enjoy nature and the beauty of the city. Notre Dame students will participate in an all-day design charrette Saturday (Nov. 1), and will present their ideas from 1 to 2 p.m. Sunday (Nov. 2) at a public reception in the Bond Hall gallery at Notre Dame. Steil started collaborating with a group of people working to shine a positive light on downtown South Bend, including Notre Dame alumni Andrew Elegante, a local business owner, and Aaron Perri, executive director of Downtown South Bend Inc. “The idea originated with them, and they are really working on the development and building the park on Jefferson Bridge,” Steil said. A Notre Dame group, Students for New Urbanism, became involved along with students from the University’s Colleges of Engineering and Arts and Letters. On Saturday, the students will meet at the bridge and spend the day sketching out ideas, creating models and finding ways to highlight South Bend’s beauty. “The idea is that people can use the space. People can just sit and talk to one another on the areas of grass. It should be really accessible nature and not just to look at,” Steil said. “We’re talking about pavilions or sculpture pieces that will also be windows that will frame beautiful views of South Bend, which people have not been able to look at because they’re just driving over the bridge. After the design charrette, the students will share their concepts with the organizers of South Bend’s 150th anniversary celebration, scheduled for 2015. DTSB Inc. has planned several events to mark the occasion, including the garden on the bridge. While DTSB is working on its own plans for the bridge, Steil hopes that the students’ work will be incorporated. The designs will also be uploaded to a public gallery on the School of Architecture’s website. The designs for the garden will have further use, however. Steil said the concepts created for the ephemeral garden will inform Notre Dame’s plans to build a permanent park at Bowman Creek, where the University has been participating in cleanup work over the past several years. DTSB plans to create its garden in the spring, Steil said. 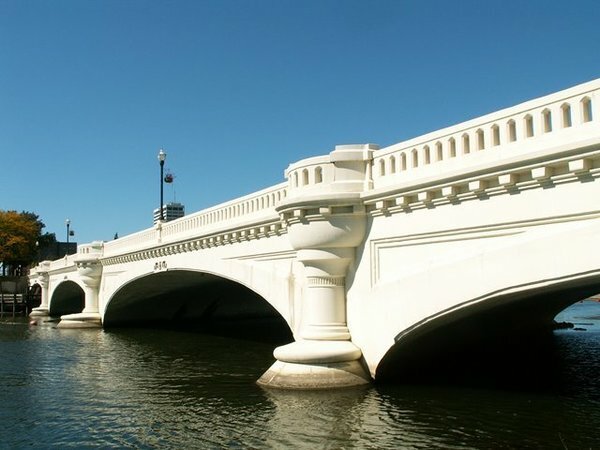 At the time of the 150th anniversary celebrations, the School of Architecture will host an exhibit of the students’ original designs for both the Jefferson Street bridge and Bowman Creek projects. Steil is excited for residents of South Bend to slow down and enjoy the bridge in the spring. Originally published by Brittany Collins at news.nd.edu on October 31, 2014.